Kareem Abdul-Jabbar was born in New York a day after Jackie Robinson broke Major League Baseball’s color barrier, and he never forgets the UCLA predecessor who made so much possible for him. “The prevailing racial attitude of the day held that blacks lacked the athletic skill, courage and intelligence to play against whites,” Abdul-Jabbar recalls. 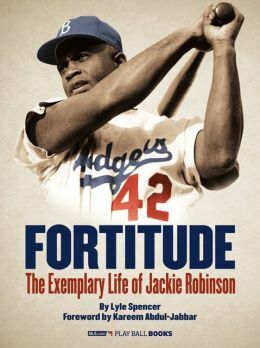 “Yet, every time Jackie took the field, he played with an intensity and skill that immediately set him apart from the average second baseman. My old friend–and by old I refer both to the duration of our friendship as well to his nonagenarian status–Ray Robinson has written a new book(let). It has been published more or less to coincide with Opening Day, that national celebration of hope. My hope is that one day, when I grow up, I can be like him. As an impressionable lad I read Ray’s stories at SPORT Magazine and his annual paperback volumes, published under the rubric Baseball Stars. Ray’s role in my eventual career path is uncertain, but it couldn’ta hoit. I read his later, more substantial biographies of Lou Gehrig and Christy Mathewson when I was already hardboiled as a sportswriter and was equally impressed.